Thanks to Richard Carrier for his review of Sources of the Jesus Tradition, and for his earlier coverage of the conference that preceded this book. Having read most of the book I can concur with many of Carrier’s assessments of its (very mixed) quality. R. Joseph Hoffmann, editor of the book, has written a response, and Carrier has in return replied to this. Ah, the refined art of academic throat slitting and knife twisting! In the course of his review Carrier discusses conference papers that he deeply regrets were not included and that led me to catch up with his earlier blog post on the conference presentations themselves. So I copy here excerpts of Carrier’s review highlighting the best of what appears in Sources, and collate additional information from his earlier post on contributions that I personally find the most interesting. The Trobisch and MacDonald reviews at the end of this post are my personal favourites. So the following will be redundant for those already familiar with Carrier’s blog and views. But there is much I omit. I only include my favourite bits here. Do read the very extensive book review and the details of the conference papers as they were delivered. Note the overlap between Gerd Lüdemann’s and Earl Doherty’s arguments about Paul’s writings, too. A. J. Droge: Jesus and Ned Ludd: What’s in a Name? A.J. Droge’s “Jesus and Ned Lud[d]: What’s in a Name?” both as presented and pre-circulated was one of the most important papers in the field of Jesus myth studies ever produced, and its loss here is a disaster. Even just its inclusion alone (when added to the other good material retained) would have made this book’s list price just about warranted. In it Droge thoroughly documents and analyzes the case of Ned Ludd (“founder” of the 18th-19th century Luddites), providing source citations and scholarship, demonstrating that he did not exist, and yet an entire movement was credited as having been founded by him, complete with biography, tales, and teachings, within a generation of when he was supposed to have lived (about thirty years of his supposed techno-sabotage, and thus within his very lifetime, had he lived, and lived to a commonly reached age). This establishes a useful case to compare with Jesus, to ascertain how likely the same may have unfolded for him (and, of course, it refutes the claim that such a thing can’t happen). After this came A.J. Droge . . . professor of literature at the University of Toronto at Scarborough (and co-author of several books on ancient Christianity), who read his paper “Jesus and Ned Lud[d]: What’s in a Name?” which I found unexpectedly fascinating. Droge confessed he was an agnostic about the historicity of Jesus and might even be leaning to the conclusion that Jesus was apocryphal. And the gist of his paper was pretty much that: that just as Ned Ludd (the apocryphal father of the Luddite movement) is likely ahistorical, and even if not, unrecoverable (and therefore, either way, only the mythical Ned Ludd can be studied now, so that’s all we should study, much the same conclusion MacDonald maintained at the conference), so, too, for Jesus. He argued the analogy holds, but he and others conceded that more comparative studies like this are needed before we can be certain. To this end, Droge summarized the latest research on Ned Ludd and drew some parallels with the extant Jesus tradition. 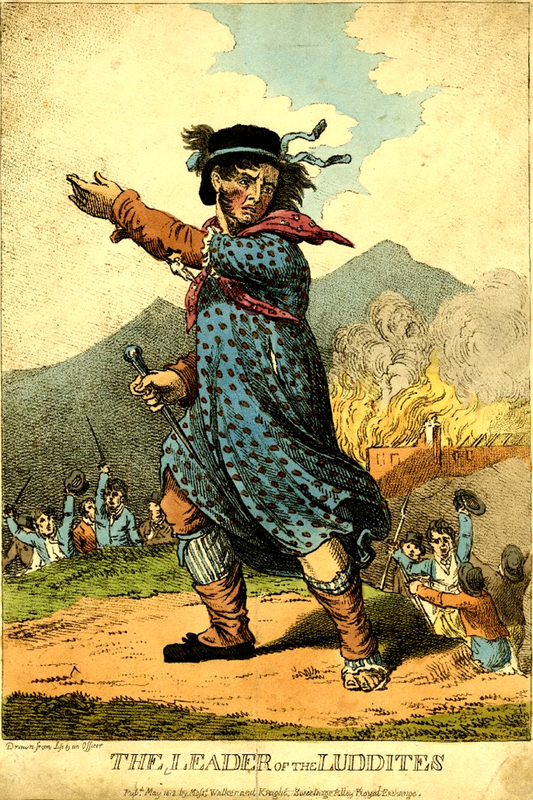 Like Jesus, Ludd had many contradictory traditions arise about him well within a century–in fact many quite rapidly, within 40 years of his alleged techno-sabotage in 1779, an event that historians have failed to find any evidence of, or of the man at all, yet by 1810 he was a revered hero and imagined founder of a movement (or several originally unrelated movements) of antitechnocrats. Soon all manner of stories were circulating about him, even fake letters by him were written as early as 1812, and novels about his life within decades of that. Droge argued that since it’s silly to try and find the “historical” Ned Ludd (whether he existed or not), it’s just as silly to try and find the “historical” Jesus (ditto). At some point in the conference I made the counter-point to Droge that a common explanation for any given Christian tradition about Jesus is that Jesus actually said or did something (or people reacted to something Jesus said or did) that inspired that tradition. So we cannot presume Droge is correct that we cannot recover any history about Jesus. Droge (or anyone else who shares his view) has to demonstrate that all such arguments (i.e. every attempt to explain specific traditions by appealing to some underlying historicity) are invalid or unsound. That would be a valuable achievement in its own right. But it must actually be done before moving on to Droge’s desired project of only studying the traditions as traditions, rather than as vehicles for preserving kernels of historical fact. Achieving one or the other (i.e. proving Droge either right or wrong about this) is exactly what the Jesus Project should be about. So I found his paper a good wake-up call to the real problem we need to solve. Continuing from Carrier’s review of the book chapter, But the three most important chapters in this book, which alone make it worth having (if you can get a cheap copy) . . . . .
Robert Price followed him with “The Rapid Attribution of Fictive Sayings and Stories to a Mythic Jesus,” bringing up the examples of fabricated sayings (and biography) for Jesus in the Infancy Gospels, and then elaborating on the comparative analogy of the legendary development of the Islamic Hadith, the oral traditions about the deeds and sayings of Mohammed and his circle. Just as it’s impossible to honestly reconstruct which if any of the Hadith sayings really came from Mohammed (not least because the evidence shows sayings and stories were freely invented, even consciously invented, to serve ideological interests), so, too, the sayings of Jesus. Or so Price argued. But whether the analogy carries over completely or not, he’s right that this presents us with a methodological parallel at the very least. Even the Mishnah, BTW, was the same thing: alleged traditions of legal matters handed on by Moses by spoken word rather than in the written Torah, and then (supposedly) “preserved” orally for a thousand years. The Talmuds were the same again, this time for oral traditions of Rabbis interpreting the Mishnah. But the issue, I think, comes down to how quickly this can happen, and that’s where the battle will be fought. After lunch Saturday we started again with Gerd Lüdemann’s rather brilliant paper on “Paul as a Witness to the Historical Jesus.” I say brilliant because it was surprisingly brief and succinct, yet thorough, persuasive, and spot on. (For those who don’t know, Dr. Lüdemann is a widely respected professor of New Testament Studies at Georg-August-University, Göttingen, with a considerable body of books and papers, and who was famously fired from an earlier professorship for no longer believing in Jesus, cf. resources at the Secular Web). Lüdemann was actually startled by the conclusion of his research on this subject, which is that Paul’s epistles show no knowledge of a historical Jesus beyond a few generic and stylized declarations of dogma. To be precise, he concludes there is no reliable evidence regarding the historical Jesus in Paul’s letters. Lüdemann stops well short of concluding they don’t support his existence. He devoted some time to arguing that some evidence in the epistles shows Paul knew of such a person, he just didn’t know anything about him that we would consider useful. Instead, Lüdemann finds, Paul’s Jesus was clearly not based on the earthly Jesus at all (even if there was one) but the celestial Jesus that Paul in fact talks about constantly. Though Lüdemann is still defending historicity, his findings were self-confessedly cold comfort to historicists, which is a trend I’m seeing of late. Dennis MacDonald, for instance, once acknowledged (or so I’m told) that most if not all the names of persons intimately connected to Jesus in the Gospels may be mytho-symbolic creations, and (as he more or less said at the conference) that the Gospels as a whole are essentially literary inventions rather than histories, yet he stops short of concluding from this that Jesus didn’t exist, and even defends historicity by various arguments. But you can see what direction this trend is heading. Despite the efforts of Christian apologists like Paul Eddy and Gregory Boyd to reverse this trend (e.g. in the anti-mythical The Jesus Legend), their arguments are heaped with special pleading and question begging, while mainstream scholars seem to be moving the other way. In his actual conference paper, I thought Hoffmann made an extensive and well-organized argument that the New Testament documents were produced by a faith community for preaching and propaganda, and not as disinterested (or even interested) biographies or memoirs. We see no indication in them, or in the first two centuries, any discussion of sources or reasons to prefer one account to another. They all just make Jesus do or say whatever they want. Which seems an obvious point, but laying the evidence out really drives home the implication: they weren’t even interested in knowing what the truth really was; they were only interested in the “truth” being the way they wanted it to be, and then just declared it so. This is a radically different situation to be in than for any other ancient historical person. Hoffmann discussed how the nativity stories were invented to make a point (as is proved by their being completely contradictory, but also by the obvious symbolic and propagandistic elements in them), and not constructed from historical sources or analysis (as neither sources nor analysis appears in them), and if the Gospels can invent such elaborate historical narratives, we can have little hope anything else in them is any more factual. Similarly, the process of deciding the canon proceeded according to circular and dogmatic criteria rather than any objective method of determining document reliability. Hoffmann’s main theme was to illustrate the use of these documents to fight sectarian ideological battles, so that to expect them to also be reliable historical sources is like expecting a man to serve both God and Mammon. Trobisch’s chapter . . . . is not the material presented at the conference. Instead it’s a rather random grab bag of, again, some of the results of his thesis, rather than an argument for that thesis. At the conference he discussed numerous kinds of physical and textual evidence in the manuscripts that only makes sense if the New Testament was published, all 27 books, in codex form, near the end of the 2nd century. He made a pretty convincing case, adding to the case made in his CSER article (issue 2.1, possibly the same as published in Free Inquiry 28.1), which is actually more worth reading than this chapter, as is his book on this subject (The First Edition of the New Testament), and yet there was a lot of material in his conference presentation that isn’t in either. None of which is in this chapter. Again, a great loss, as the material actually presented would have made this chapter, and with it the whole book, required reading. I can’t fathom any editor not agreeing with that and convincing Trobisch of it and thus getting the best chapter in the book (particularly as it was the actual conference paper), rather than this one, which is mediocre, and won’t convince anyone of anything. Then up was David Trobisch (who studied under Theissen and was most recently professor of the New Testament at Bangor Theological Seminary). I was very keen to hear his talk, after reading his provocative “Who Published the Christian Bible?” in CSER Review 2.1 (2007: pp. 29-32) and finding it very convincing in light of other research I’ve done. His talk summarized some of the elements of this, and his book The First Edition of the New Testament (2000) well beyond his CSER article, which altogether made his case even more convincing. What is his argument? That the present New Testament canon is based on an actual four-volume codex edition published around 150 A.D. (+/- 20 years), partly in response to Marcion (Trobisch has also argued that Polycarp is the most likely redactor and publisher–although he admits we can’t prove this, several clues make Polycarp a strong candidate). Trobisch’s case fits the evidence so well, and explains so much so well, it’s hard to doubt he’s right (at least in most respects). Trobisch also makes a good case that the named authors of the Gospels were fictional additions invented at this time, when the whole NT also underwent considerable redactional activity that essentially solidified what we now call the Textus Receptus (and therefore, IMO, this is actually as far back as we can reconstruct the text–what the documents looked like before this publication is almost entirely inaccessible to us now). I must say I’m convinced. He brilliantly employs physical evidence, paleography, literary and textual analysis, and other well-established tools and facts (some of it often overlooked), which all converges on the same conclusions. Trobisch’s argument also entails, BTW, a late date for our Luke-Acts (which was heavily redacted from earlier drafts now lost, as has long been argued already, e.g. Strange’s The Problem of the Text of Acts 1992), and corroborates MacDonald’s conclusion that even the original Luke-Acts is late. Indeed, the world’s leading expert on Acts, Richard Pervo, now argues (on similar and additional evidence) that Luke-Acts dates to the first half of the 2nd century, in Dating Acts: Between the Evangelists and the Apologists (2006). So this seems to be the trend today in biblical scholarship on Luke-Acts. . . .
MacDonald’s chapter in this book is a highly technical bare-bones survey of the comparative results of his new theory that Mark, Matthew, and Luke all used not Q but a lost “Deuteronomy Gospel” in which the story of Jesus parallels, point for point, the entire book of Deuteronomy (mythically constructing Jesus as a new Moses). As such the chapter is purely a reference work for people wanting to pursue the theory, not an argument for that theory, and most readers will find it unintelligible or unreadable. Hence its being the first chapter in the book, after Hoffmann’s indulgently irrelevant “preface,” is one of the weirdest editorial choices I’ve ever seen. As editor I would have told MacDonald to compose instead of this a chapter more like what he presented at the conference, and circulated beforehand: an actual survey of the evidence and argument for this proposed reconstruction, not the actual reconstruction itself. And this wouldn’t be difficult, as MacDonald would need merely excerpt and adapt the pages on this from his forthcoming book, which he precirculated, so I know this excellent material exists, and so should Hoffmann. No editor worth his salt would let this go. As it is, no one is going to be persuaded by MacDonald’s chapter that his thesis is correct, and many won’t even be able to grasp what his thesis is. And that’s a terrible shame, because MacDonald has really good arguments and evidence supporting this thesis, and for it not to be here is a scandal. I wonder if MacDonald was even consulted about this (or if Hoffmann just grabbed one piece of MacDonald’s precirculated material and slapped it in), but even had he been and asked this be done, I (like any good editor) would have persuaded him not to go with that, but something more persuasive and summarizing, using the other material I already knew he had. Instead, this chapter is a lost opportunity, and is not really worth reading, unless you are a serious bible scholar keen on reverse-engineering his thesis from a long, raw list of its results. Next up was Dennis MacDonald, a professor at Claremont School of Theology, whose work on the emulation of Homer in the Gospels I’ve long admired (see my old review of his first book on this subject). His theory of Homeric emulation is certainly correct as a whole, although I think he over-interprets many cases, where there probably was no intended connection. I find emulation of the Septuagint in the Gospels is far more extensive and fundamental, extending even to their overall structure, and the Homeric link only a secondary addition padded on. Now I learn MacDonald is heading in that direction, too. In fact, his conference paper was an enormous surprise to me, and brilliant, heralding a book he is currently writing (and shared excerpts of before the conference began, and summarized in his talk), which solves the Synoptic problem in a way that is not only entirely novel, but IMO most probably correct. After reading recent work criticizing the traditional Q theory (e.g. Goodacre’s The Case Against Q and Goodacre & Perrin’s Questioning Q) I was starting to despair that we’d ever have a coherent and defensible theory of the relationship of Mark, Matthew, and Luke and their lost sources (and once again starting to realize that New Testament scholars love to parrot a consensus built on sand as if it were settled on rock). Then along comes MacDonald and his new thesis, completely departing from his focus on Homer, and tackling the Synoptic problem, and yet nailing it in a way I didn’t expect anyone could. I’m not sure everyone was convinced, but I’m also not sure they read through all the materials he had circulated. In a nutshell, he argues that Luke used as his sources the Gospels of Mark and Matthew (as Q-deniers have long maintained), as well as the Dominical Logia referred to by Papias, and that in fact this Dominical Logia was used as a source by all three Synoptic Gospels, Mark included, and in effect represents the original (and now lost) Gospel of Jesus (as I would put it). The clincher for me is the fact that a surprising effect arises from the reconstruction that follows from his theory: the Dominical Logia appears to be a mythical emulation and transvaluation of the Septuagint book of Deuteronomy. As this fit is highly improbable unless MacDonald’s reconstruction is correct, I think MacDonald is going to win this argument in the long run. Another thing MacDonald argues (in fact, IMO, even more convincingly) is that Luke-Acts was written after Papias and is in fact a deliberate response to Papias and the Gospel situation he described and lamented. His demonstration of this fact is fairly persuasive (e.g. Luke’s preface is so obviously an emulation and transvaluation of Papias’ remarks that it’s a Eureka moment when you see it). MacDonald dates Papias early, however, c. 100 A.D., but this still puts Luke-Acts 105-115 A.D. (which actually agrees with the recent trend in Luke-Acts studies, e.g. the latest work of Richard Pervo and David Trobisch, below). I’m skeptical of his date for Papias, however, since it’s based solely on the tense of a single verb implying he knew living Disciples of Jesus (but that interpretation is not so secure, IMO, nor is Papias reliable enough to trust on such a point) and contradicts the report in Irenaeus that Polycarp and Papias were good friends (since Polycarp is mid-to-late second century). Nevertheless, his take on these things will be argued (with thorough scholarship and clear reasoning) in his next book, so keep your eye out for it. That will also contain a reconstruction of the lost Dominical Logia, which I expect will eventually replace what we now mean by Q. Throughout the conference MacDonald emphasized that his work and others’ essentially entail the Gospels should be entirely taken off the table when attempting to get at the historical Jesus, as they are not at all useful for any historical data (almost the same conclusion reached by Burton Mack, Randel Helms, and many other mainstream scholars of recent times). In MacDonald’s view, we can only extract from the Gospels what their contents meant to their authors (their underlying meaning, and purpose for being written), and he recommends this is all we can do, and thus all we should do. I partly disagree, as there is still work to be done first (as I’ll explain below), but I think in the end he’s right. Other papers Carrier discusses are also informative. I’m pleased to have come across his positive comments on Bruce Chilton and James Tabor. I had only known these authors from some of their books that I found far from persuasive, but Carrier shows us the human and professional personal side of these scholars, something I much appreciate. Posted on 2011-06-01 09:56:34 GMT+0000 by Neil Godfrey. This entry was posted in Bible as literature, Biblical Studies, Gospel Origins, Historiography and tagged A. J. Droge, Christ Myth Hypothesis, David Trobisch, Dennis R. MacDonald, Earl Doherty, Gerd Lüdemann, Hoffmann: Sources of the Jesus Tradition, Jesus Project, Justin Meggitt, R. Joseph Hoffmann, Richard Carrier, Robert M. Price. Bookmark the permalink. Though I am curious why you have chosen to reproduce virtually the entirety of this diatribe. Do you really think this advances discussions? Or is it that you are so mythtified that you can’t see things straight any longer? E.g., while I call Carrier’s essay wholly inadequate, he calls me insane. Do you see that as dispassionate and objective scholarly analysis? Really? Reproducing virtually the entirety of your diatribe? Baloney. Did you read anything I wrote or reproduced? I linked to it, yes, but I copied only those sections I found personally most intellectually interesting for their scholarly content addressing the issues — including a positive presentation of yours (and not Carriers)! And I attempted to collate Richard’s comments from the conference and book chapters for this same reason. It is your own comment that is the one that has exposed the dirty linen that I had no wish to repeat here. You’re another one of those pleasant chaps who was presumably willing to accept my posts praising your works but cannot handle having culpable errors of fact pointed out to you. As Carrier pointed out, what kind of editor lets a “wholly inadequate” essay into his book? An “insane” one, apparently. It’s called hyperbole. Carrier’s justifications make more sense. 1. Droge: Ned Ludd — Steven Carr has used the Ned Ludd phenomenon to challenge a number of scholars who “argue” (often “pursue with hostile intent” rather than engage in rational discourse) against mythicism, and some of those scholars have totally poo-poohed the very point of the analogy. Well — I think it’s interesting to see a scholar from their own guild acknowledge that this phenomenon does have something to offer after all. 2. Meggit: The cultural background is something I am always keen to learn more about in this context. I look forward to exploring more deeply Meggit’s arguments. 3. Price: The Moslem analogy — I’ve heard this before, but it’s worth thinking about, especially since, thanks to R. Joseph Hoffmann himself a while ago, I have learned that there are scholars of this religion who suggest that Mohammed himself was also mythical. 4. Ludemann: Paul — I like Ludemann, having had brief correspondences in the past over some things he has written, though he probably does not recall me. And I have found his ideas closely in synch with much of the way I have been thinking, too, and of course we are naturally biased towards anyone who agrees with us. But what I found especially intriguing is the similarity between his interpretations of Paul’s letters and the arguments of Doherty. Now who are all those hostile anti-mythicists who savage Doherty for reaching some of the same conclusions as one of their peers? 5. Hoffmann — I liked the introductory overview he presented as recorded by Carrier: the result of ongoing studies into Jesus has only been to produce a bigger cloud, less certainty, etc. Now that ought to tell us something. 6. Trobisch and MacDonald — Now these are new ideas that I have not yet explored. I am very keen to track down related works of theirs, even their original conference papers, to learn more. 7. There are others I would also like, too, and I am interested also in exploring more thoroughly Carrier’s Bayes’ theory and finding time to apply it myself. I look forward to digging my copy of Sources out of a box where it is for now packed securely away, sort of, and having another look at it. But Carrier’s summary of the conference papers in particular have given me enough to pick up and follow through till then. I chose the title of this post carefully, “Jesus Myth studies”, not “Jesus mythicism studies”. There is a difference, though they clearly overlap at times. Some of the contributors do clearly flirt with the idea of Jesus being “a myth” at point of origin, too. I do know there are other scholars who have indicated a respect, and even approval, of the idea, and I have listed several other names on this blog in the past. Personal correspondence also indicates to me that there are at least a number of other biblical scholars not yet publishing in this particular are who also lean towards the idea. It’s a shame that personality quirks seem to get in the way of certain scholars and their followers. Hopefully Doherty is right, and that the future will leave the likes of McGrath et al lost in wake of scholarly history. This type of back and forth is interesting. It’s weird for me to see, since I am a completely self-taught amateur and I learn in bits and pieces here and there as I slog along, these days mostly from the internet and particularly on Neil’s blog, which I found when it frequently popped up in my search results. Anyway, the point is that it’s weird to see information like this from people whose books are on my shelf (Hoffmann) or that I’ve learned a lot from online (Carrier), and to ge to see scholars like this comment on this blog. When I set out to learn all I could about the origins of Christianity and the Bible I joined a few online discussion groups where I was able to observe authors of books I had read discuss issues, and being able to sometimes discuss with them and communicate by email was a major learning experience for me. The internet is an incredible facilitator of learning. It’s also an eye-opener to where some scholars are coming from. On Deuteronomy as a founding text, I found this sermon that basically argues Jesus was a rabbi whose favourite book was Deuteronomy. Ricki Watts has published a study on Mark being based on the idea of a Second Exodus. I have been intrigued by the way the original ending is not unlike the ending of 2 Kings, and its opening like the Second Temple sectarian view of Adam spending 40 days in the Jordan River and the birth of Israel from the Red Sea and going intot the wilderness. In between we have the appointing of the twelve (patriarchs/tribes) as the foundation of the new Israel, the glory displayed in the middle, the miracles like Elijah’s and Elisha’s . . . it appears to be a mini-revision of the Primary History of Israel, with the same uncertain/ambiguous/hopeful ending that drives home the main lesson for the readers: Don’t be like “old Israel” but be the “new Israel”. I am currently reading John Taylor’s “Classics and the Bible” and am interested in his comparison of the New Testament narrative with Virgil’s Aeneid – Virgil based his epic on key episodes from the much larger works of the Iliad and Odyssey in order to write a new epic as a founding story for a new age emerging out of the chaos of the old. This is quite an eye-opener! Rikki E. Watts (p. 118, n. 149) briefly mentions the idea that Jesus, in overcoming Satan’s temptation, reverses Adam’s fall. It would have been interesting to know whether the Markan author had actually read about Adam’s baptism in the Jordan. This would explain a lot. According to G. W. E. Nickelsburg, the Apocalypse of Moses and the Life of Adam and Eve “are only a small part of a vast Adamic literature generated in Jewish, Christian, and Gnostic circles.” The books “may themselves be based on an earlier Adamic testament or testaments…” (“The Bible Rewritten and Expanded,” in: M. E. Stone, ed., Jewish Writings of the Second Temple Period, 1984). The methods used by Biblical historians are fantastic, unless you want to apply them to the task of doing history. They are above such mundane matters as finding out whether or not Judas existed. Should we infer from the good doctor’s backhanded compliment that he believes other mythicists do not acknowledge that NT scholars use historical criteria? Is he having another episode of transient global amnesia? Of course the criteria are the same. However, the application is flawed, and the conclusions are untenable. Are there other fields of study where professional, public intellectuals yearn for their brethren to return to the fold? Is Carrier not allowed to “join in any reindeer games”? I gather this careful description is designed to exclude Robert M. Price, who has two doctorates: one in systematic theology, the other in New Testament studies. It’s funny how mainstream NT scholars can pose as historians and nobody raises an eyebrow. WOW! The review of the work of Meggit and Hoffmann reminded me of a remark of Nietzsche’s about Greco-Roman humanity, that the word ‘true’ was ascribed to statements depending upon how they made one feel, not upon the relationship they bore to empirical, external reality. If it ‘felt right,’ it was ‘true’. Something to bear in mind re.the Ignatian epistles e.g. when he says Jesus was ‘truly’ born, suffered, died etc. (alethe). I think. Doherty was right to assert that it was not precisely what we think of as docetism that he meant.